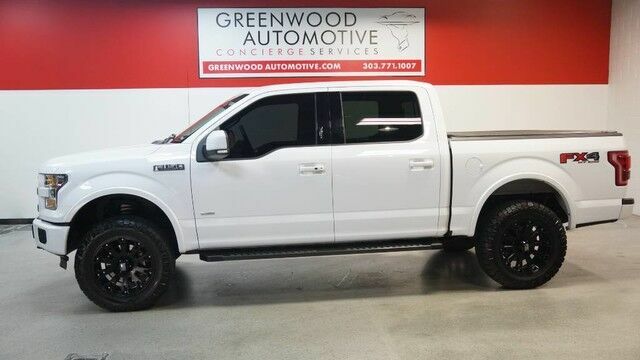 BEAUTIFUL 2016 FORD F150 LARIAT, LOADED WITH UPGRADES, INCLUDING BOSS REAR SHOCKS, LIFT KIT, F150 REAR BLOCKS AND U-BOLTS, UPGRADED NTTO RIDGE GRAPPLER TIRES, XD800 MISFIT 20X9 BLACKOUT WHEELS, CLEAN CARFAX, GREAT MAINTENANCE HISTORY, ALWAYS A COLORADO-BASED TRUCK, WWW.GREENWOODAUTOMOTIVE.COM for all Photos Our Dealer Handling fee of $499 is included in our advertised price. Government fee's and licensing are additional costs. For best service and to check availability or to set an appointment to see and drive call Steve direct at 720-339-1516 or Marc at 303-552-7909 For more information. FINANCING AVAILABLE. TRADES WELCOME. *VEHICLE IS FULLY INSPECTED BY OUR MECHANIC. We are located 4 Blocks West of I-25 on North side Of Arapahoe, Behind US Bank at Syracuse St.